Our Party Room accommodates from 50 to 130 guests seated with ample Dance, DJ and food serving areas. While our price range allows for decorating time with either a short 4 hour schedule parties or additional time for late evening dance parties. Our Center Stage Hall is designed to comfortably accommodate up to 400 Guests Seated. With a Large Dance Floor and with optional features to create the most Extreme Event. The Fiesta Center Ballroom Hall is the complete Venue setup to accommodate 1,000 Seated Guests and able to handle up to 2,600 in total attendance. This Ballroom has a very large Dance Floor and with four Commercial Restroom facilities. 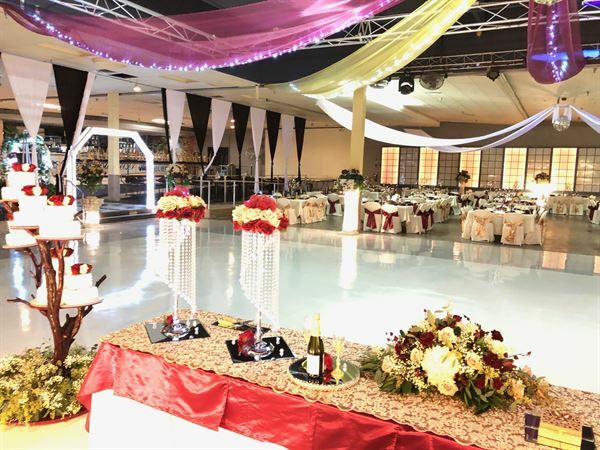 In addition, The Fiesta Center can provide professional Sound & Lighting Production with a experienced Engineer of oversee all applications of Special Lighting and Special Effects such as Stage Geysers and Custom Foggers that provide for a Brilliant Light Show. The Ballroom Hall has high ceilings with central heating and air to provide a comfortable climate for attendees. Also important is the spacious concrete parking lot that is secured with Gate entry allowing for safe arrival and departure of Guests. Package Terms CANCELLATION POLICY: In case of Cancellation the all Payments will be considered NON REFUNDABLE RESCHEDULE POLICY: In case of a need to Reschedule the Event all Payments made will be applied to the new scheduled Event Date Only if a Written Request is provided to Management 60 Days Prior to Event Date. If a Written Request to Resch is submitted with less then 60 days Prior to Event Date only 50% of all Payments made to date of notice will be applied to the New Scheduled Date. The Fiesta Center requires a 50% payment of selected Hall Package with all balances to be paid in full two weeks prior to Event Date. The method of payment accepted for the balance of the package (Cash or all Major Credit/Debit Cards). Special offers and discounts if applicable must be provided to Client in Written form such as being stated in a Receipt or Rental Agreement. If a Discount is offered by any Representative Please ask for a Written form that represents the Venue and the terms of the Discount. Verble Arrangement, Agreement or Discount WILL NOT BE CONSIDERED VALID UNTIL PROVIDED IN WRITING. Special Features: Multi-media, Sound & Lighting Production, Portable Staging, Runways, Special Effects Foam and CO2 Cannon.